Folic acid, also known as folate, is a B vitamin essential for good health. Because it is a water-soluble vitamin, your body does not store it in your tissues and therefore you must consume it in your diet every day. The recommended daily intake for folate is 400 mcg for adults, increased to 500 mcg per day if you are breastfeeding and to 600 mcg per day during pregnancy, according to the Linus Pauling Institute at Oregon State University. 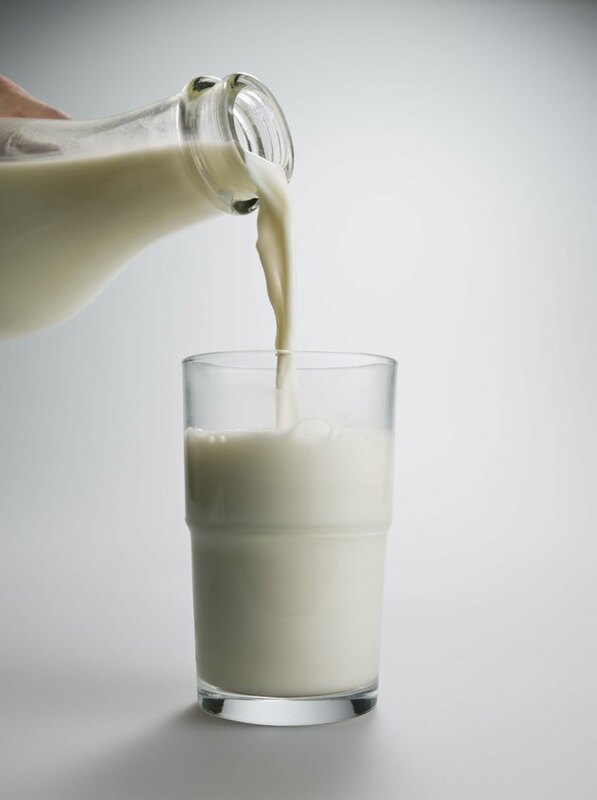 Milk, although a good source of many nutrients, supplies your diet with only modest amounts of folate. Folate assists in the metabolism and synthesis of amino acids, the building blocks of proteins. For example, your body requires folate to manufacture the amino acid methionine from its precursor homocysteine. This vitamin also plays a critical role in the metabolism of nucleic acids, molecules that drive the synthesis of proteins in your cells. Therefore, folate is indispensable in tissue growth and development. The folate in milk helps you meet your daily requirement but by itself does not provide a substantial amount of this vitamin. Because the rapid rate of cell division and increased metabolism during pregnancy elevate your body's need for folate, a deficiency of this vitamin may occur when you are pregnant. Alcoholism and other conditions of low dietary intake may also result in a folate deficiency. Symptoms may include anemia, caused by an inability to replenish your red blood cells, and accompanying weakness and fatigue. Low folate levels in the months leading up to conception and during early pregnancy may result in a neural tube defect in your developing child. Due to the relatively low levels of folate in milk, other sources of this vitamin, such as fortified cereals and legumes, are better choices for adding folate to your diet. Although toxicity due to overconsumption of folate-rich foods is unlikely, adults should not consume more than 1,000 mcg of folate in a single day, reports the Linus Pauling Institute at Oregon State University. One concern of overconsumption of folate relates to vitamin B-12. A deficiency of either vitamin can result in megaloblastic anemia, and if this condition is treated with supplemental folate when the anemia is really caused by a vitamin B-12 deficiency, the continuing lack of vitamin B-12 may lead to irreversible nerve damage. Milk, with its limited supply of this vitamin, poses little risk of folate overconsumption. An 8-oz. serving of milk supplies 15 mcg of folate to your diet, corresponding to 4 percent of your suggested daily intake and even less if you are pregnant or nursing. Milk products such as cottage cheese supply slightly more: 25 mcg per cup, or 6 percent of your daily requirement. Even consuming four servings in a day will provide you with less than 25 percent of the amount you need for optimal health. What If I Don't Drink Any Milk During Pregnancy?